Merilyn Rose White Pezzuto RN, 1923-2014 served proudly as a member of the Cadet Nurse Corp at Dibble Hospital in Menlo Park, California. She has shared stories and memories of this very important experience. These stories included stories about patients that she came to love and the struggles that they experience due to their time in foxholes, defending our freedom, and the anguish that they had about being injured and not being able to continue the fight. 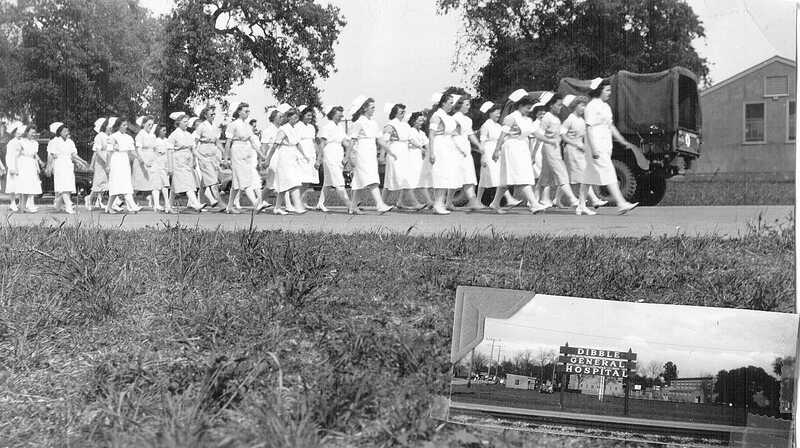 Often she shared stories of the friendships she had with other nurse corps members and the importance that those friendships had not only during the difficult times of the war but even to her adulthood. Many of the skills of leadership, service, and commitment came from the time spent in the Corps. The role models she became inspired many young people. Each of her six children modeled some gift that she learned though her life. Her daughter Eileen studied nursing and went on to be involved in nursing administration. She is currently the regional VP of care coordination at Sutter Health in San Francisco. Her granddaughter, and Eileen’s daughter Sarah too entered the field of nursing is following her grandmothers commitment to health care as a practicing nurse at John Muir Hospital in Walnut Creek, California. She is currently working on her Masters degree at the University of California, San Francisco. Merilyn also inspired many including her daughter Rosemary who followed her footsteps into the military and served 20 years in the US Coast Guard. Her sons Don and Tom went into business and have served the community through their work. Cici inspires young people through her job as a career counselor—something she watched her mom do as she mentored many young people through her lifetime. Mary has spent the recent years as a consultant and using her creativity to serve in the community. Each of these attributes came from the knowledge, Skills and Abilities that Merilyn learned in those important years as Cadet Nurse. Merilyn loved the nurse corps and what it stood for. Over the years, she wished that more could have been done to recognize the important work the corps did for the war effort. The attached pictures are of mom as a Cadet and of them marching at Dibble. She often felt that the Veterans Administration and Congress should have elevated the importance of the role and validated it with recognition of the service these individuals provided. Merilyn Rose White Pezzuto died on May 27, 2014, in Walnut Creek California. She served in the Cadet Corps during WW2. She loved the corps and what it stood for. She was an amazing woman who had a strong impact on the world. She was stationed at Dibble Army Hospital San Francisco for her service. Merilyn attended St. Josephs School of Nursing, San Francisco, California. After her graduation from St. Josephs, she went on to complete a degree at Dominican College of San Rafael where she used her nursing skills as the college nurse providing health care to the students and faculty of the college. About Dibble Army Hospital---The hospital was located on the estate of Mark Hopkins and affluent railroad and hotel man from California It was named after Col.John Dibble who was killed in an aircraft accident. Between 1943 and 1946 Dibble specialized in plastic surgery, blind care, neuro-psychiatry and orthopedics and at its peak it had 2,400 beds. In June 1946 the hospital was transferred to the Federal Public Housing Authority.